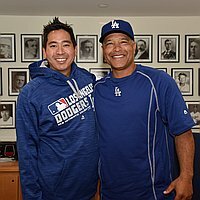 Dave Roberts, the first ethnic minority manager of the Los Angeles Dodgers will give a talk about his life and career at the Japanese American National Museum on Saturday, June 18, at 10:30 a.m. The discussion will be moderated by Scott Akasaki, the Dodgers’ Director of Team Travel. Roberts will discuss his history and future with the Dodgers; how his half-Japanese, half-African American background has informed his perspective; his current role as manager of a storied franchise; and opinions on his players including Japanese pitcher Kenta Maeda. Roberts will be available to sign items for attendees after the program, limit one item per person. The event is presented as part of the museum’s Tateuchi Public Program series. The series, organized in partnership between the Atsuhiko and Ina Goodwin Tateuchi Foundation and the Japanese American National Museum, develops presentations that explore the connections between Japan and the United States in the context of politics, art, music, and culture. Admission is $9 for the public and free for JANM members. Seating is limited; RSVPs are required for members and pre-payment is required for non-members. Museum admission is included. For more information, visit janm.org. Making Waves: Japanese American Photography, 1920–1940 is an in-depth examination of the contributions of Japanese Americans to photography, particularly modernist photography, much of which was lost as a result of the mass incarceration of Japanese Americans during World War II. The exhibition, curated by photography historian and educator Dennis Reed, presents 103 surviving works from that period alongside artifacts and ephemera that help bring the era to life. With this inventive exhibition, the traditional Japanese art of origami—folding paper into three-dimensional figures—is transformed from a childhood pastime into a sophisticated international art form. Nine contemporary artists, working in six different countries and ranging in age from 29 to 71, present a bold and innovative group of folded-paper works that include sculpture, large-scale installation, and conceptual pieces. Above the Fold is curated by Meher McArthur and toured by International Arts & Artists, Washington, DC.